Description: Empties arrive at the yard. Description: Westbound empties grind to the top of Proctor Hill. Lake Superior is obscured by low level clouds. Description: Westbound empties grind to the top of Proctor Hill. 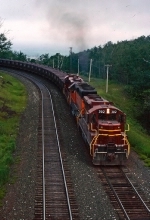 Description: Eastbound loaded ore starts down Proctor Hill. Description: Eastbound loaded ore starts down Proctor Hill. Lake Superior is obscured by the low level clouds. Description: Westbound empties pull into the yard. Description: Westbound empties roll north of Alborn. Description: Westbound empties roll south of Forbes. Description: Westbound empties at Forbes. Description: Climbing the hill to Proctor, DM&IR 417 is working hard up Spirt Mountain. Description: CN E9s 103 and 102 continue to sit outside Woodcrest. Also note retired DM&IR SDM 317. Title: Flashback to 2009 on the Missabe at Proctor MN in July 2009.